For one day this spring, donating clothes will be even easier thanks to an innovative partnership between Goodwill Industries of Southeastern Wisconsin and Metropolitan Chicago, and the popular on-demand transportation platform, Uber. On Saturday, May 2, between 10 a.m. and 3 p.m. donors can open the Uber app on their cell phone or mobile device and request a pickup for their donations to be delivered by an Uber driver directly to their local Goodwill, free of charge. Join Us for the Grand Opening Festivities in Brown Deer! Join us as we celebrate the Grand Opening of our Goodwill Store & Donation Center at 9305 N. Green Bay Road in Brown Deer, WI, from May 22-24! We're Hiring in Montgomery & Naperville - Attend a Job Fair! We're Hiring for our New Goodwill Store & Donation Center in Palatine! Our Goodwill Store & Donation Center in Brookfield is Hiring! 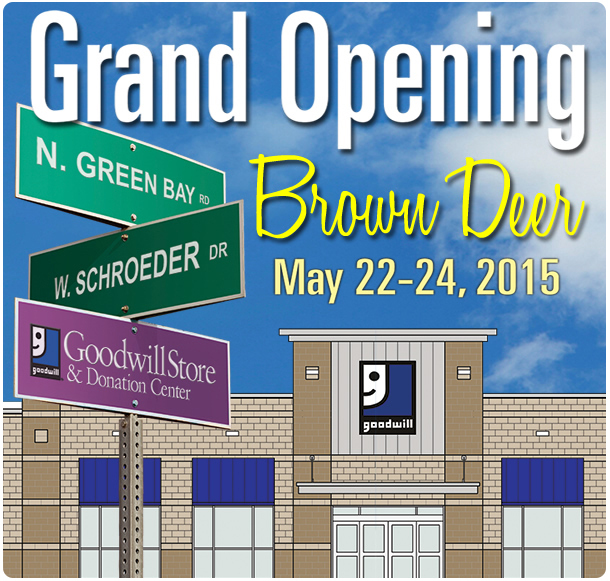 Newest Goodwill Store & Donation Center Opening Soon in Brown Deer! at 9305 N. Green Bay Road in Brown Deer, WI, from May 22-24! Goodwill Industries of Metropolitan Chicago is proud to announce a new partnership with MakeSpace. We will come together to make donating to Goodwill easier than ever! When you shop or donate items to Goodwill you are greeted by staff in shirts that say "Reduce, Reuse, Recycle" that share our message of environmental sustainability. The idea of being green has always been an underlying philosophy at Goodwill. The Amazing Looks Model Search is Back! Our Amazing Looks model search is back! You already shop and donate to Goodwill; now is your chance to model the great fashions you can find there, on the Amazing Looks section of our website! Think you’ve got what it takes? Simply show us your favorite Goodwill outfit, which highlights your sense of style! Just make sure 75% of the items that make up your outfit are from our stores. Now go ahead, and show us what you’ve got! 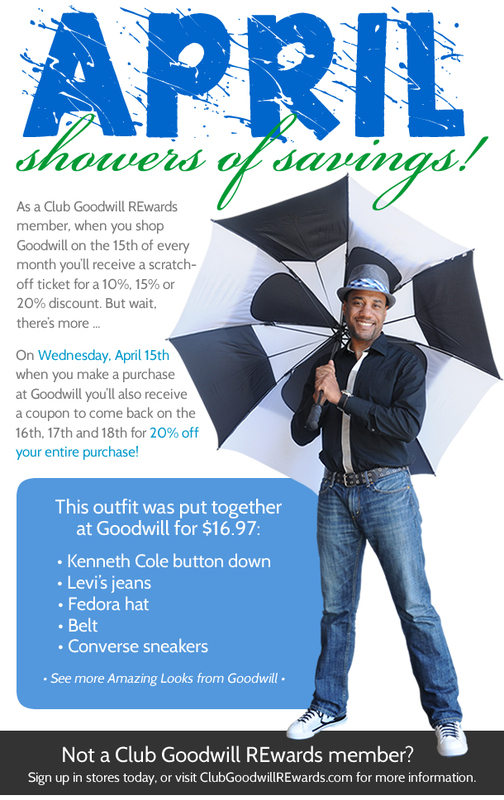 Get Showers of Savings in April! This offer is only valid when a customer makes a purchase on the 15th of the month. The coupon will automatically print at the time of purchase. A "gift card only" purchase and purchases under $.49 will not generate a coupon. Face off your clutter ... clear the zone ... clean out your closets! Get the entire family involved in gathering gently-used clothes and household items, then go to any participating Goodwill Store & Donation Center between Wednesday, April 1 and Thursday, April 30, 2015. Simply indicate your school name, city and number of items donated on the slip provided to you by the Goodwill Donation Attendant, and the school with the greatest number of items donated will recieve a visit from Chicago Blackhawk Patrick Sharp. It's that easy! Open to elementary and middle schools in the metropolitan Chicago territory only. Click on the button below to view the most current results! The Pack'er Up Donation Challenge is Going on Now! Earn a chance to have Retired Green Bay Packer Donald Driver visit your elementary or middle school! Save On Color-Tag Merchandise April 6th & 7th! Take 50% off select color-tag merchandise Monday, April 6 and Tuesday, April 7! Which color will you save on this week? Simply stop by your local Goodwill to find out! Sale color will vary by store.